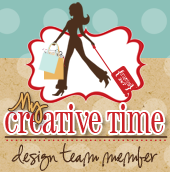 Welcome to day #2 of the August My Creative Time Sneak Peek Week! I am so excited to share my project for you today. Who said its too early for Christmas? I have seen a ton of Christmas decor all over my local craft stores. Today I wanted to share this layout I made using the It's a Magical Season set. I love this set! 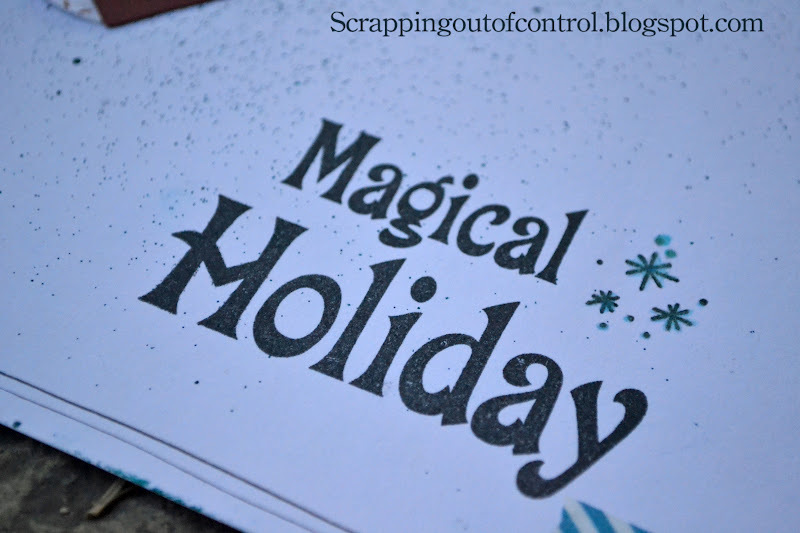 I stamped my title with the sentiment "Magical Holiday". This sentiment can be used for pretty much any holiday though. 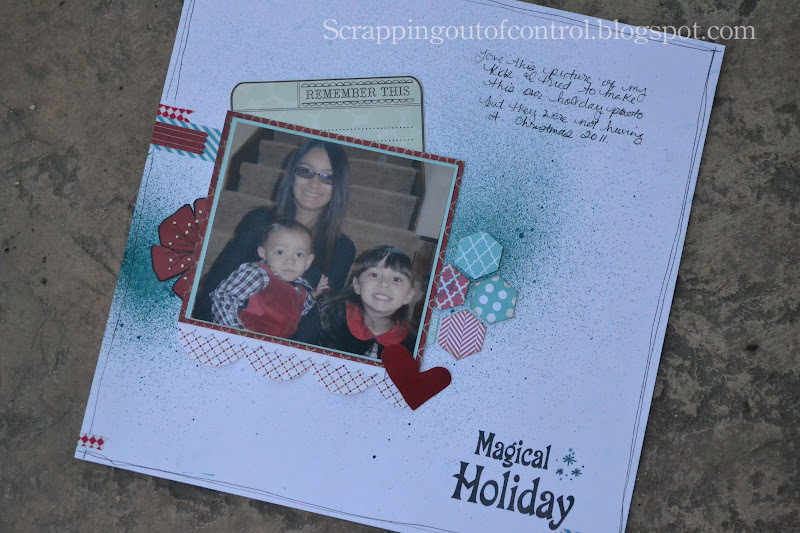 I used a plain white card stock for my layout and sprayed it with Mister Huey's Spray. Did you see the washi tape? Well take another look.. The red "washi" is actually the banner from the MCT Just Simply Live! Isn't that awesome! You will have to wait until Wednesday for a glimpse of the set. LOVE! Thank you for stopping by today! Don't forget to visit the DT for more chances to win and of cousre to get inspired!!! Big crafty hugs! What a beautiful LO, You are definitely right! This stamp is so versatile! Love it! SO cute! Love LO ideas. Such a nice layout. Thanks for sharing. What a great great great layout. Love the colors and the different shapes. Great job. Great layout! Love how you used the stamp for the title, and it fits so well, too. TFS! Lovely layout, love the hexagons! Wonderful layout! Thanks so much for sharing! Beautiful layout! Very creative use of the MCT stamp set. What a perfect layout Nancy! I always need layout ideas and yours are always fabulous! Great LO. I love the misting spray and the colors. Great job on your layout! I like the spray and simple embellishments. Beautiful! Great way to use the stamp. It works well on the layout. Just the right size. Love your layout Nancy. TFS. Awesome layout. I love how you highlighted Miss Emma's new set and made your layout with plain white cardstock and misting it. Love your layout - love her new stamps too! Nancy ~ OMG! Your layout is just BEAUTIFUL! I LOVE it to pieces! First your children are just BEAUTIFUL and so STINKING CUTE!!! I LOVE how clean this is! What a FABULOUS idea to mist the background too! Everyhting is just PERFECT! Love the layout page great job on it!!! Hi there, thanks for sharing your layout all love all your detailes!!! Cute layout! Loved that you used the stamp for your title. Very sweet LO, sometimes the picture speaks for itself. Wonderful layout. I like the hexagons and the misting. What a neat layout! I love your style :) Great picture too!!! What a beatiful layout. Nice picture. Cute layout. Clean and sleek--I like it. SO cute! It definitely puts me in the Christmas spirit. Very cute and beautiful picture!